Creamy, round, with grapefruit, ginger and soft floral notes. Unripe banana, sake. Malty sweetness, spicy richness. Notes of bitter orange. Smooth, sweet, changing from honey to toffee. 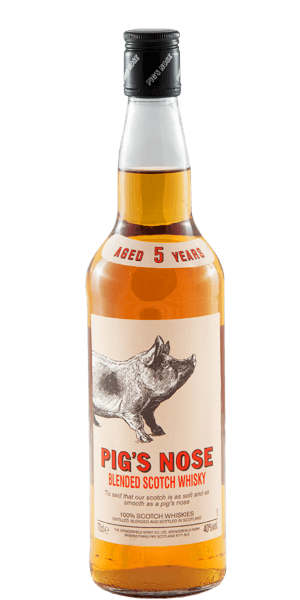 Pig's Nose 5YO is adored for its caramel, honey, sweet and spicy flavor notes. This Scotch is carefully distilled at Spencerfield Spirit Co distillery. Based on 13 votes, the average rating for Pig's Nose 5YO is 6.9/10. — A wonderful scotch for impromptu malt moments! A wonderful scotch for impromptu malt moments!